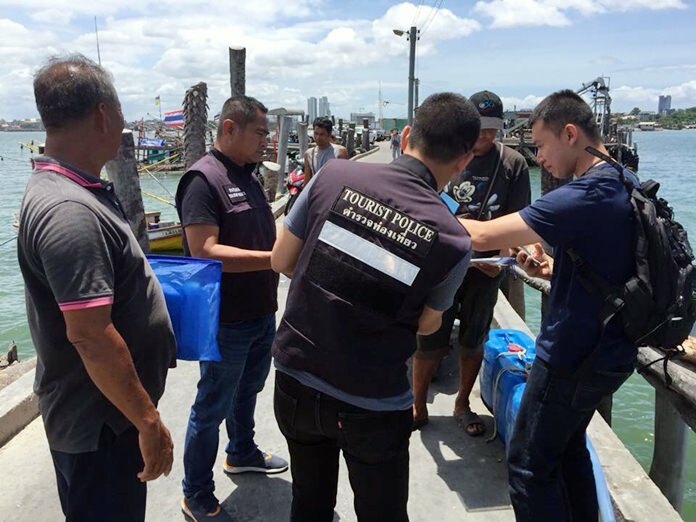 Pattaya tourist police hit the high seas to check fishing boats moored offshore, looking for criminals posing as fishermen and fugitives hiding out on boats. Tourist Police commander Pol. Lt. Col. Piyapong Ensarn led the Sept. 3 operation he called a “routine” measure to reinforce safety for tourists. He said, in the past, petty thieves and those wanted on arrest warrants have posed as fishermen to hide from authorities and evade capture. This time, however, no criminals were found and no arrests were made. Officers also took the opportunity to check licenses and permits and also found no irregularities.